I know this is Black Friday. I should be doing some kind of promotional thing for my Etsy shop. But guess what…I’m in the middle of another road trip. The shop will have to wait until I get back. Think of this as a break from all the consumerism and a chance to dream about making stuff. You know how the web leads down some many rabbit holes. I found the FIELD of rabbit holes at one podcaster’s website. Here’s how I wondered into this field…Kristen Nicholas, of Getting Stitched on the Farm, posted earlier this year her podcast interview by Abby Glassenberg of While She Naps. Of course, I had to go listen to what Kristen is doing. I was surprised that the format was so different from all the other crafting podcast interviewers. 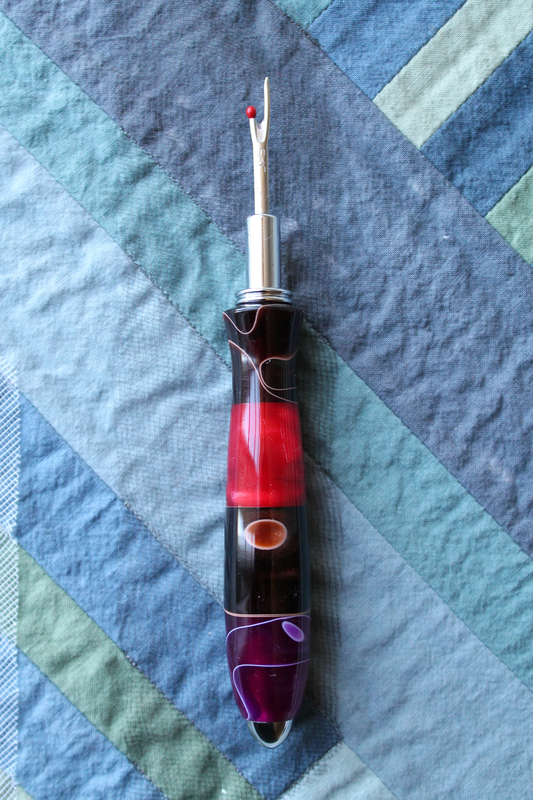 It is more about the behind the scenes/business side of the crafter’s life. She is asking all the questions I’d be asking. Abby’s podcast immediately became one of my favorite weekly audio listens. She finds people in so many areas of creativity that I wouldn’t normally encounter. Ok, I like seeing all possible rabbit holes for future deeper exploration. Plus the second half of the podcast is a round robin of their favorite things. When I listen, I must have a notepad at hand (or be on her website to checkout the links) to dig deeper into their favorite things. So many tips, tricks, apps, or tools that have made my life easier. This interview is on the website and not a podcast. I’m guessing it’s because you have to see the pictures she’s included. I love how Jenny Maj of Fluffmonger styled her soft toys. So cute! beautiful botanicals (mushrooms and plants), birds (love the owls) and gossamer ships of muslim and lace. 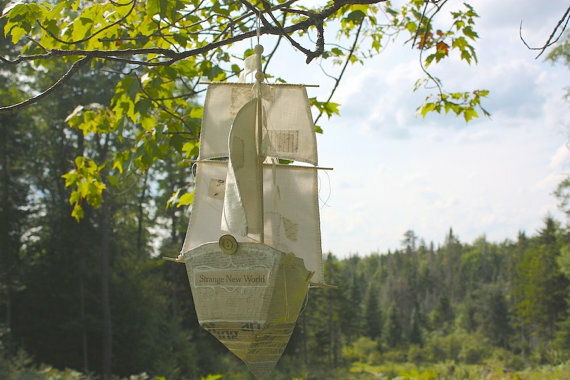 I bought the ships pattern as a weekend craft project. 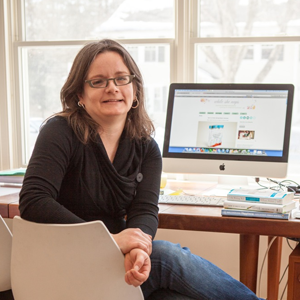 Most of you knitters and crocheters know Kristin Nicholas. She’s a regular expert on Interweave’s Knitting Daily TV. 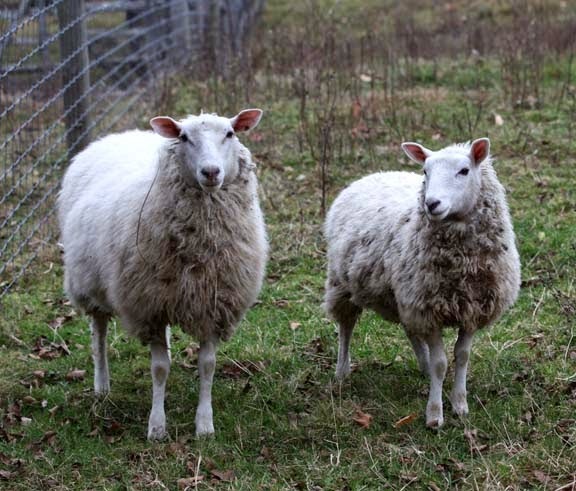 I love her blog about living on a sheep farm in New England. Always the best place for sheepy pictures. You may as well just keep this website on your radio. 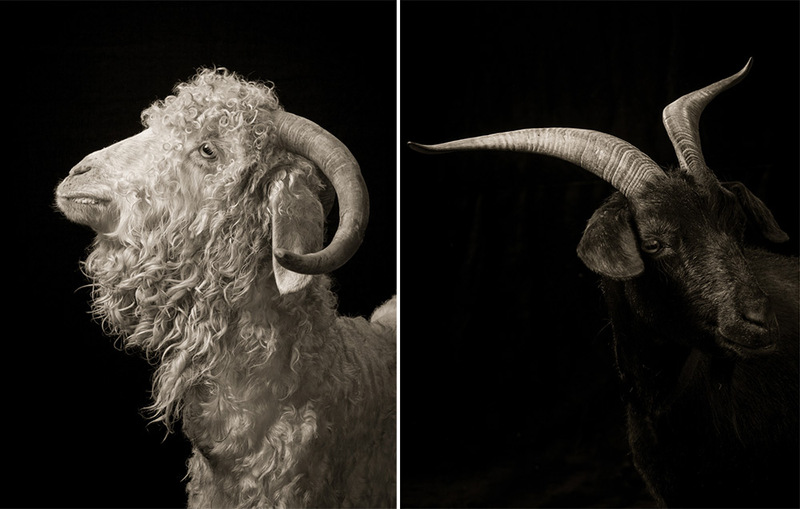 LOOK at these portraits of goats and sheep! 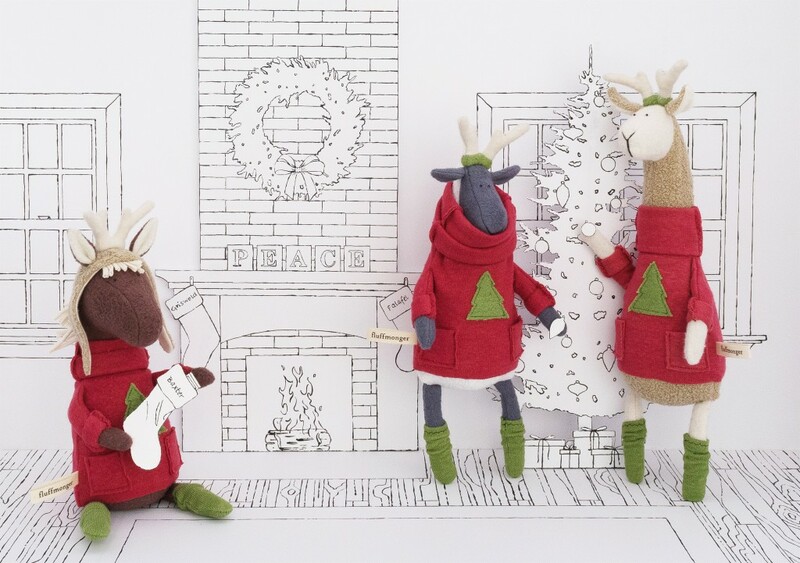 This entry was posted in Friday Finds, Knitting, Sewing, Zigzagging and tagged blogs, Craft, crafters, favorites, links, makers, podcasts, sheep, ships, toys on November 28, 2014 by slantedstitches. Another trip, but no road trip pictures. I assume you are not interested in seeing LA traffic. Besides, I flew in for a family wedding. The last time I chatted with the bride, I thought bouquets were eliminated. So it was a bit of a surprise when I found out a week before the wedding that I was making bridesmaids bouquets. I’m sure it’s a case of too many spinning plates, that she didn’t tell me earlier. I did panic just a bit. This could be a challenge since it’s ONLY been about 30 years since the last time I worked a wedding. So I’m a bit nervous, plus I’m working with two strangers, friends of the groom. Well, ok, my sister-in-law sprang the same thing a few days before her wedding (and a thousand miles from my supplies). Thank you Trader Joes (where I found most of her flowers). 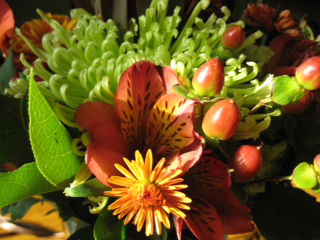 And, yes, the son’s wedding was the exception, but I didn’t make the bouquets. I made the table centerpieces and alter piece EARLY. They wanted cherry blossoms in May. 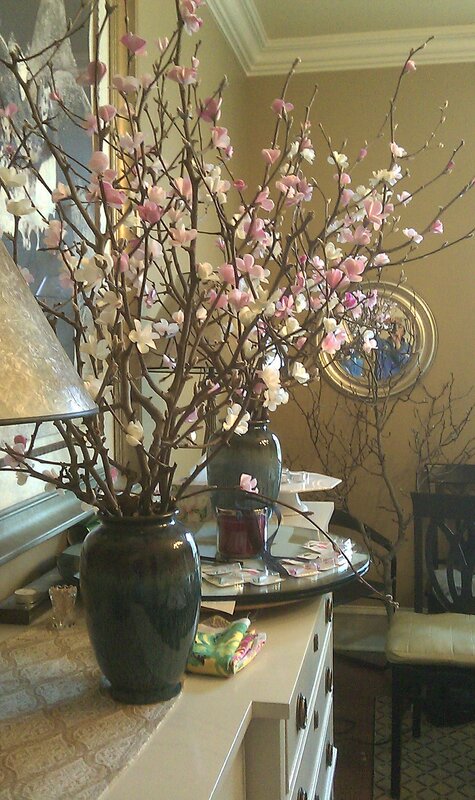 We compromised, I made cherry pies for the grooms dinner and made the cherry blossoms out of tissue paper. That took 4 months and a floral invasion of much of the house. I should do a tutorial for the cherry blossoms. I still haven’t seen anything like it online. 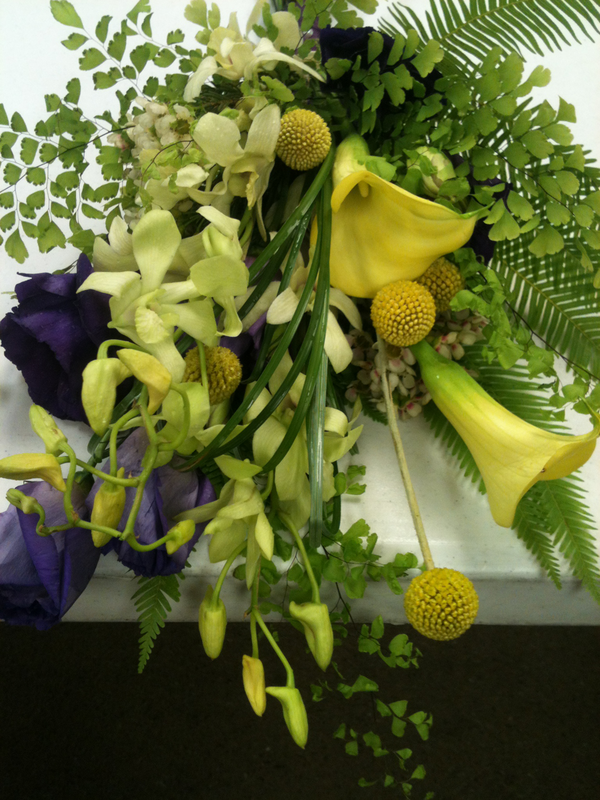 Back to the current wedding… I knew the dresses were purple and the brides’ favorite color was a yellow green. Perfect color combination. If you want the technical color analysis, I decided on a split complimentary combination of colors. 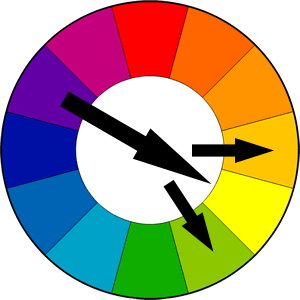 Purple’s complement/opposite on the color wheel is yellow. Next to yellow is both yellow green and yellow orange. 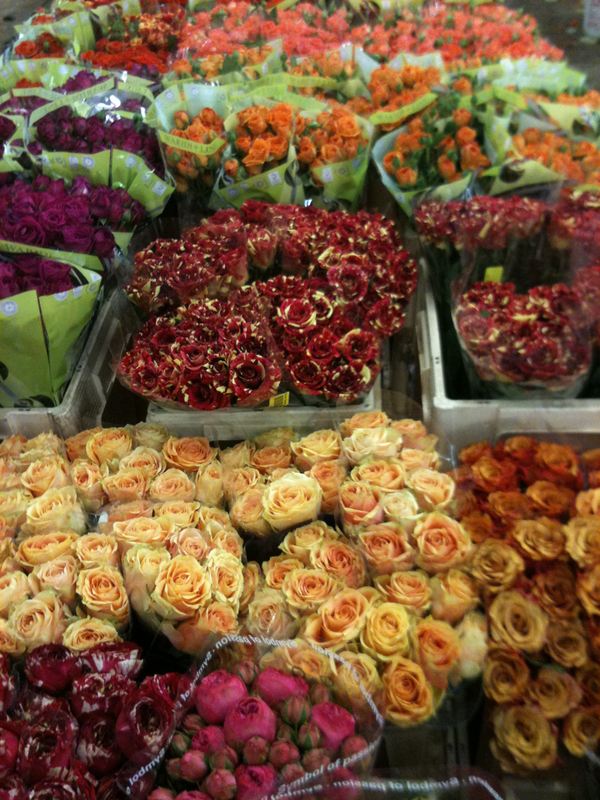 Should be plenty to choose from at the flower market. OK. No hyperventilating, we will be driving right by Michael Levine and the garment district in LA. All will still be closed when I’m riding through the area. Good thing I just decided to be on a fabric diet. Plus I will not have time to shop. 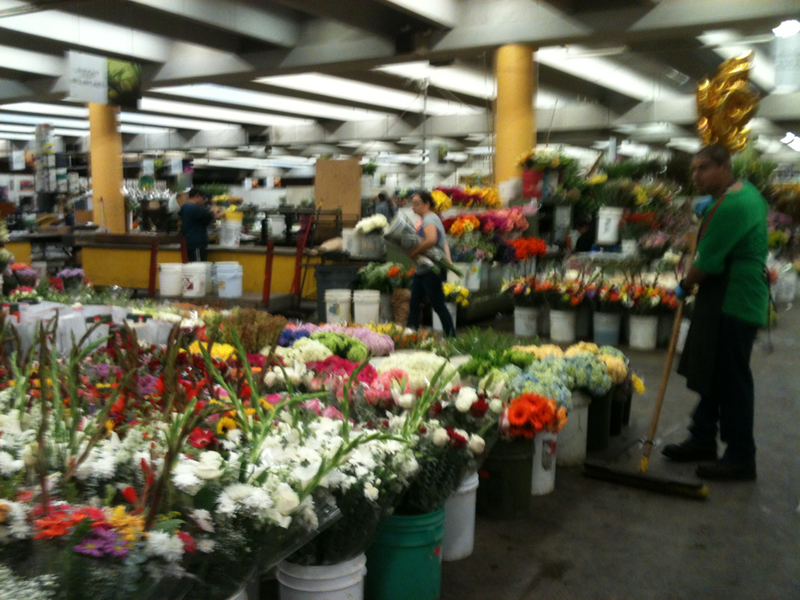 I’m not sure if I’ve ever been in the LA Flower Market. It’s big, but manageable. The great gals, strangers no more, knew who would have what. We were in and out in less than an hour, really good considering it feels like the size of Ikea. (Thanks Karen and Lynne, that was a great day working together.) 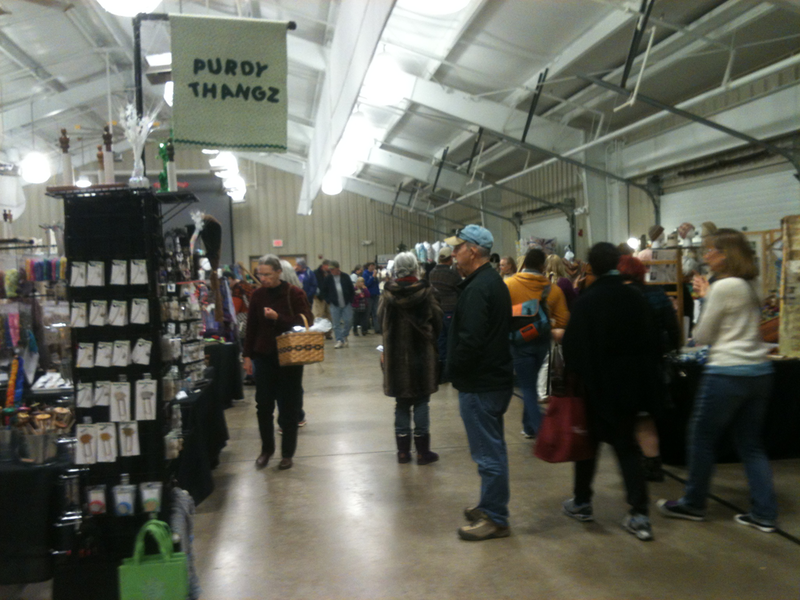 I’ve included several pictures from the market. I assume that most people have never been there. Added Melaluca and a fun yellow button/pompom. It was a fun day. Of course exhausting. I’m glad I’m home. 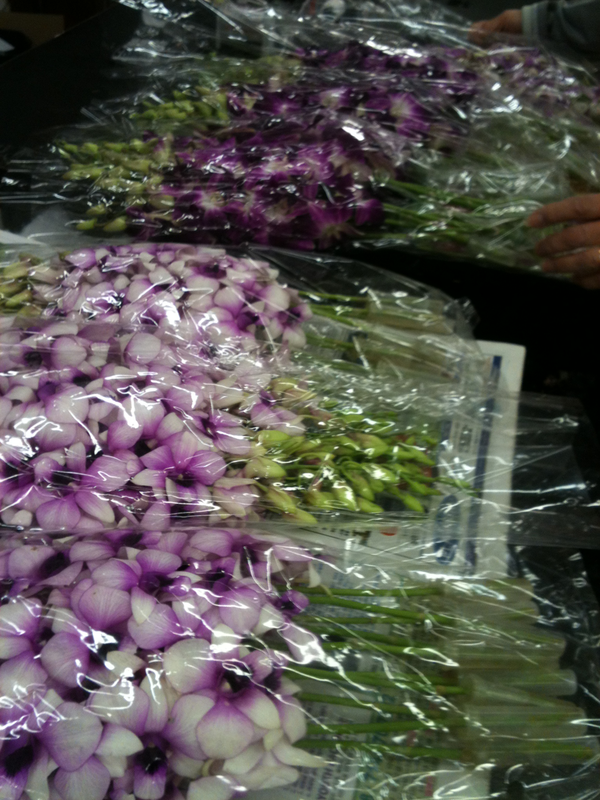 A few pictures from the market…Yes it does smell wonderful. But only when you first walk in. 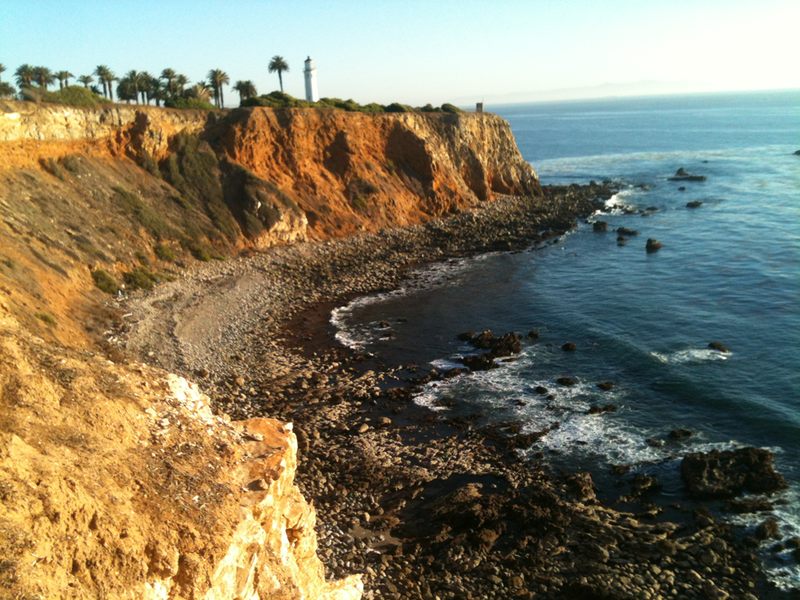 And after the wedding, a few minutes to breathe, relax and see the ocean. This entry was posted in Road Trip, Zigzagging and tagged Color, Floral Design, making, Texture, WeddingFlowers, Zigzagging on November 17, 2014 by slantedstitches. I have to start sharing the things I’m discovering on the internet. This is something I use to do with the Midsouth Knitting Guild newsletter. But now I get to share more than just knitting stuff. 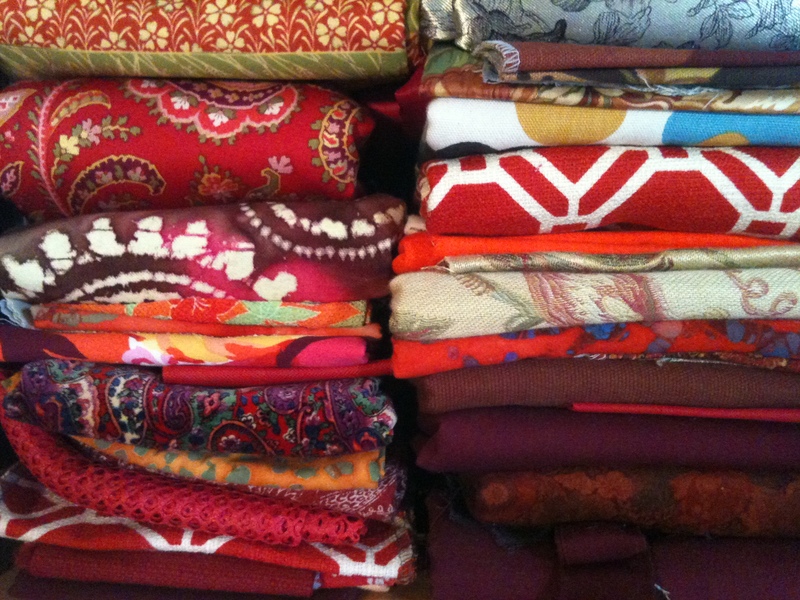 This week’s blogs about fabric…. 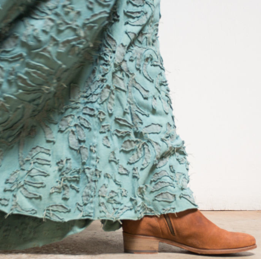 Designer clothes, organic, local artisans, handmade… I originally wrote them off as beyond my price point. They are, but I was wrong. I just started following the blog and found this post, Alabama Cotton Revisited, compelling (includes a NPR audio segment). And I’m putting their School of Making workshops and books on my bucket list. Until this year, she was just a name with a funky logo and funky designs in the Vogue Patterns catalog. I never thought of her as a real person. Wrong again. This year, I found her blog and have been following her trips to Paris, sewing projects….she has a fabric barn! This Is Colossal is an amazing website with every kind of art work imaginable. 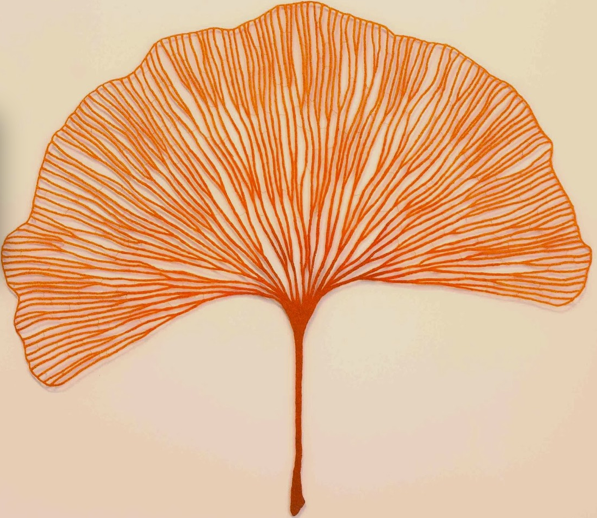 My current favorite fiber artist is Meredith Woolnough. I’m a sucker for ginkyo leaves and nautilus shells. 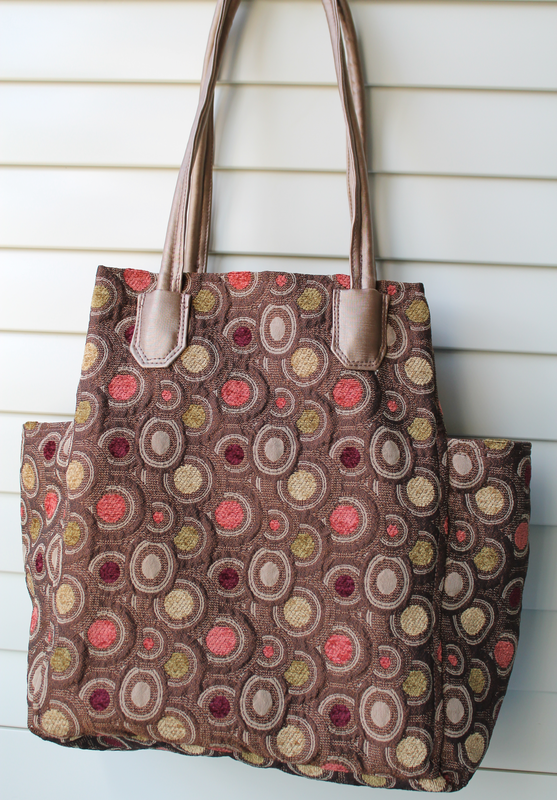 This entry was posted in Sewing, Zigzagging and tagged Blog, fabric, making, sewing on November 14, 2014 by slantedstitches. one major change needed, if staying with the rouleaux style, a metal hinge. Probably need to use a rivet to close it. More equipment and stuff to learn. And again it’s the handles. Managed to trim it down to 5 hours. The body and lining of bag takes at least a day to make. One complete bag in two days does not make a good business unless I charge a few hundred dollars. Not interested in making this thing so exclusive that my friends will think twice about buying one. Can anything else be simplified? Find a specialized leather foot that fits my machine to stitch the handles and tabs. Looking for the Babylock Leather Quilting Roller foot for a low shank. Hopefully less struggle equals faster finish. Switch to a leather handle and tab. Expensive, more equipment and supplies needed. Switch to a leather tab if I want to keep the rouleaux style. Now need to find a leather source and colors. Is this getting more complicated not less? Wait…Stick with available colors. I have black leather, purple and tan suede. I can experiment with these first. What does changing to a hardware connector between the handle and tab do? Improve the look and feel, probably. It could affect the weight. Now need to find the right hardware. 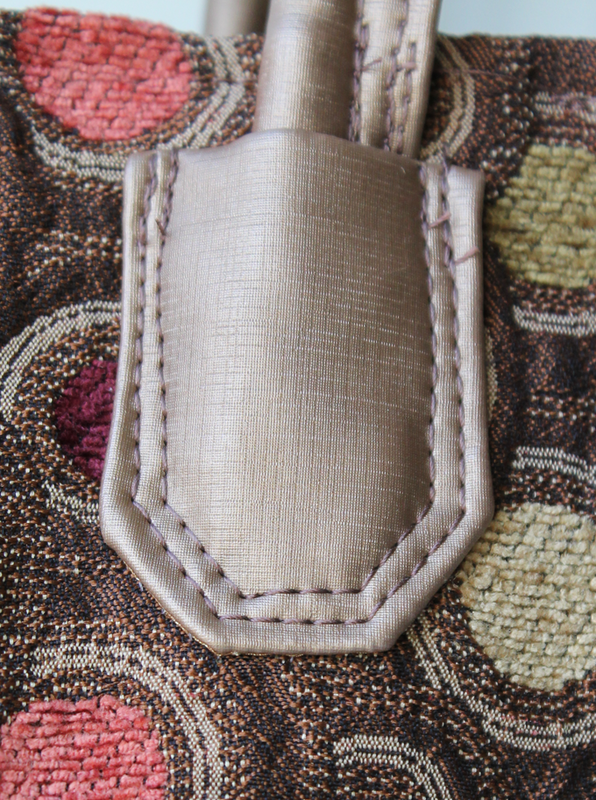 Maybe focus with fabrics that work with readily available hardware until the design is settled and interest is good. I do have smaller brass and nickel D and rectangle rings and big antique brass rings. Does it make the stitching/assembly more or less complicated? If the above don’t work, I need to design an alternative handle. I saw a bag in Seattle made of seatbelts. It’s too heavy for a whole bag but maybe the handles. Look for smaller seatbelt strapping. a. Pockets, will need to check with the gals. I’m biased towards as many pockets as I can get. This one has four. Twist my arm, I can eliminate one or two. c. Or have a front and back facing, attach the handles/tabs at the seam. I like this one better than b.
I’m starting to like this one a lot. And I can do the metal connectors and tabs. I’m going with the last idea 6.c. If 5.c. doesn’t work, than go to 5. But everything is on hold until I’m back from the trip. Road testing this bag, of course. 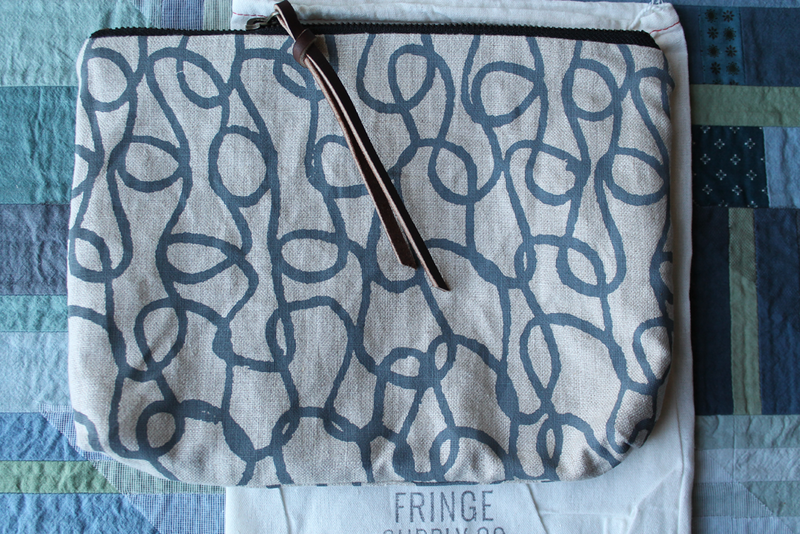 This entry was posted in Etsy Shop: Slanted Stitches, Knitting, Road Trip, Sewing and tagged fabric, faux leather, Finished Objects, FOs, knitting, making, Modifications, process, purse design, sewing on November 10, 2014 by slantedstitches. I loved the hunt…and it’s a problem. 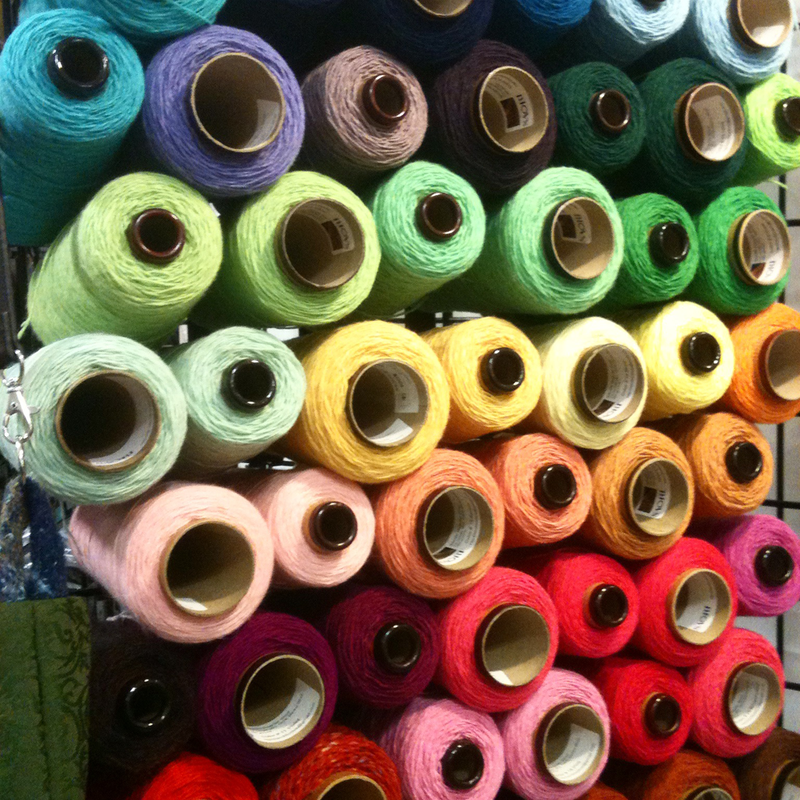 I remember as a kid, walking between the rows and rows of fabric, hearing the swish as my hands glide through them. I learned early the feel of good cotton, linen, silks and wools. Nothing like having champagne taste on a juice diet. Our favorite shop was a teeny tiny British textile shop in Carmel where Liberty cottons seemed so outrageously luxurious. Britex in San Francisco and Mode is New York are the only ones I can think of that still have that magically feel. Sigh….the good old days…Today, most of the bolts are rough feeling quilting cottons or polyester something or other, which means I rarely roam through the aisles anymore. But have you been in a decorator fabric store? Why is there such a difference between the big box stores and decorator fabric stores? It’s different from childhood memories, but still the colors, the textures, and oh, ouch, the prices…Real silks, real linen, cotton… Fortunately, most large metropolitan areas have fabric warehouses where you can find end-of-the-bolt discounted fabrics. Yeah for me! The best I’ve found recently are Dallas and Raleigh. I haven’t been to NY’s fabric district. I’m sure NY is fabulous. Don’t tempt me. below a set price/yd (this usually keeps the credit card from screaming and quickly limits my selections, otherwise, I’d have problems with decision-making). quantity, you have to buy the whole bolt or pay more/yard. It’s not well organized. Hunting takes a lot of time. I usually don’t find exactly what I want, but instead find something for a brand new project. AND here lies my problem. Reality hit while I’m walking, struggling with three bolts, out of the last shop in Atlanta struggle. Excited, I’m in love with the new fabrics, and I had enough for 20-25 bags. Simple math…if I average 5 bags a week, I have work for the next four to five weeks. BUT I have two projects to finish which will delay the start two weeks and another trip, another two weeks delay. Oh, man, I can’t even think about working on these new fabrics until middle of November. AND don’t forget about what was already bought on the last three trips. 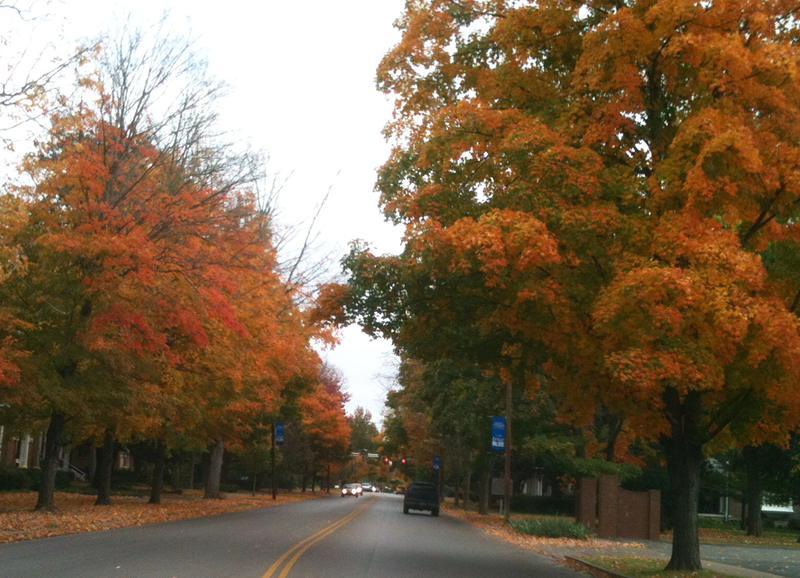 Guessing…enough for the next year. Not the same as SABLE (Stash acquisition Beyond Life Expectancy) a knitting term, but close enough. Hmm…I remember this same knock on the head when I posted all of my yarn stash. Maybe a NY trip can be a carrot for the end of next year. Oh, I LIKE that idea! Now the focus will be turned to efficiencies, modifying the designs, streamlining the process and hunting for hardware. Hardware…something new to hunt…. This entry was posted in Etsy Shop: Slanted Stitches, Sewing and tagged fabric, faux leather, making, process, sewing, shopping on November 3, 2014 by slantedstitches.